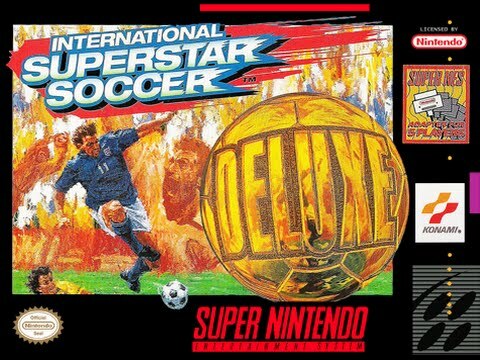 Last week we took a look at one of the better football games from the fifth gen in the form of FIFA 99, so this week we’re nipping back a generation to the Super Nintendo for one of my favourite footy games of all-time in the form of International Superstar Soccer Deluxe. It should be noted that this game also saw a release to the SEGA Mega Drive and even got a PlayStation port as well, but the version I always played was the one on the Super Nintendo, so that’s what we’ll be focusing on this week. This might be a tad controversial, but I’ll say it anyway as I think it bares true. 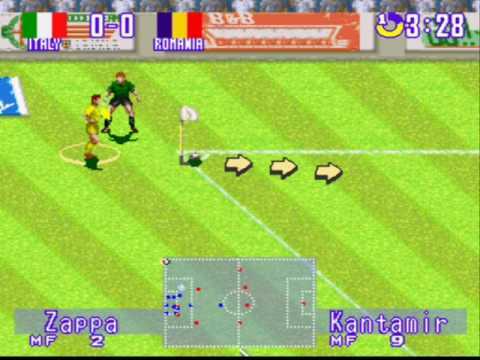 Football games were pretty rubbish until the International Superstar Soccer series. 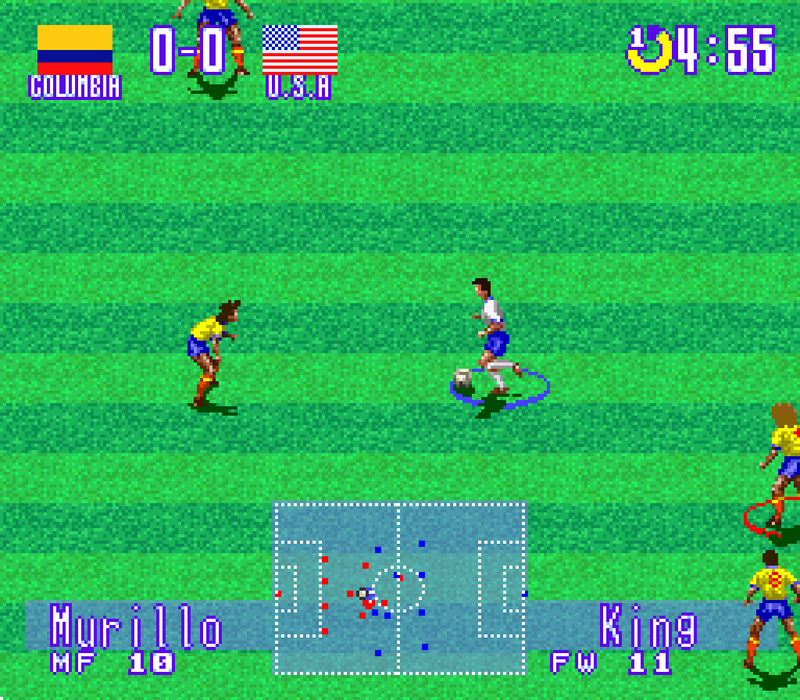 Yes, those who owned an Amiga could enjoy the top-down thrills of Sensible World of Soccer, whilst those who frequented the arcades could have devoted some time playing quick-paced thrill rides like Super Sidekicks, but for the home console market, most of the games on offer were not especially good recreations of what you’d see on a Saturday afternoon. International Superstar Soccer Deluxe is actually a sequel for the original ISS game, which is a solid outing in its own right. What Deluxe does is take all the best parts of its elder sibling and improve upon it, creating a tighter and better looking experience whilst not sacrificing any of the previous areas that made the first game so enjoyable. 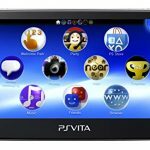 International Superstar Soccer Deluxe is not only a lot of fun to play, it also has lots of little touches that make it really feel like a proper football experience. For instance, when you make a substitution, you’ll get a little cutscene of the player warming up on the side of the pitch whilst a member of the coaching staff holds up cards with the number of each player on it (yes, back in the 90s, we had to use actual cards as opposed to electronic boards. You youngsters don’t even know you’re born!). 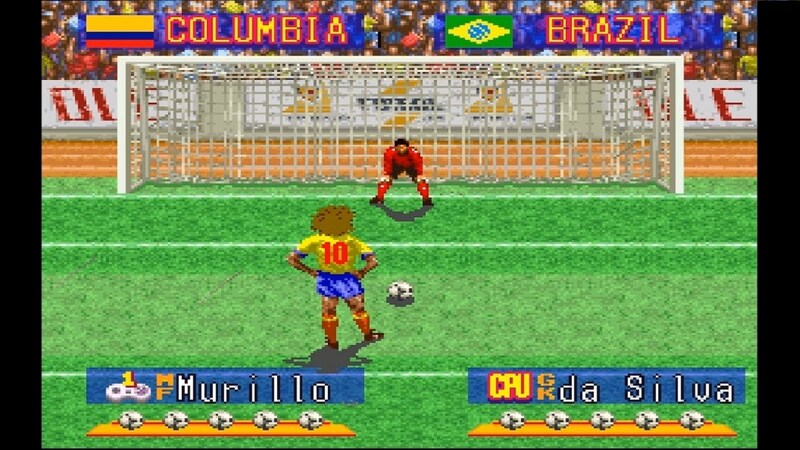 This was a far cry from games like FIFA International Soccer, which just had one player walk off to be replaced with an identical looking one straight after. Players will actually writhe on the floor in pain following a brutal tackle, whilst the tackler will remonstrate with the referee, only to hold his head to his hands when the referee pulls out a card. Sometimes a stretcher will even come on to take a player off, which usually means that the tackler will be eating a red card and will be trudging off the pitch in dismay. You’re also allowed to actually edit the colour scheme of each team’s kit, as well as get the chance to edit the stats of players as well. Graphically, the game looks better than any of the other games out at the time with much bigger and better looking player sprites. 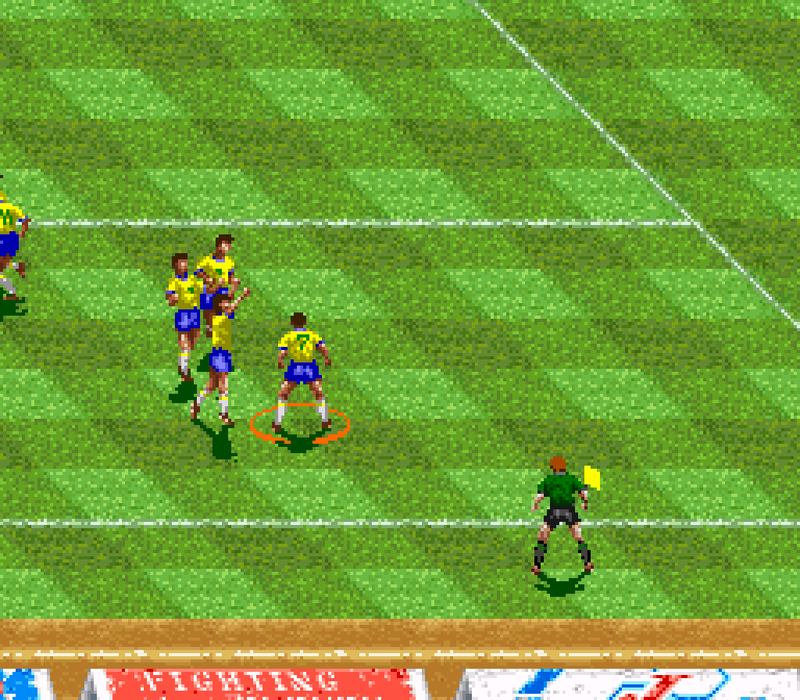 Whereas every player in FIFA International Soccer looks the same, players in International Superstar Soccer Deluxe actually look different from each other, such as Galfano having his Roberto Baggio-styled divine ponytail, whilst his Italian colleague, Carboni, has a Fabrizo Ravanelli-like grey hairdo. 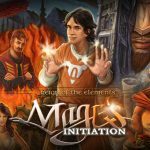 This really combines to give each player in the game their own personality, as well as pay homage to real-life players without having to pay any pesky royalties. Indeed, the players in International Superstar Soccer Deluxe exude so much personality that it’s actually possible to have genuine favourites, which was harder on other games where every player looks the same, such as in Super Soccer. People who played this game in their youth can still remember the names of their favourite players all these years later, with an attachment that is rivalled only with the generic cast of players you would inherit on the early Pro Evolution Soccer games’ Master League mode. It’s not just the players that look good; the stadiums and weather effects also looking fantastic. Most of the stadiums in the game are modelled after ones in real-life, with the England stadium looking not-unlike that of Wembley, whilst the Brazil stadium recreates the Maracanã, complete with samba beats emanating from the stands. As well as lifelike crowd noises, the game also has a hilarious announcer who yells phrases like “Great Tackle!” and “Keeper fumbled!” throughout the match. Gameplay-wise, International Superstar Soccer Deluxe isn’t anywhere close to being as deep as the series would get once it made the move to 3D during the fifth gen, but it’s still a very enjoyable kick about, with satisfying passing and set pieces where you can put a devilish curl on crosses and shots to great effect. This isn’t something unique to the game, but it does it in a really smooth way. It’s sometimes possible to even score directly from a corner if you curve the ball just right, something that ultra-skilled players like Blazek can do with comparative ease. Turning up the difficulty can make the goalkeepers almost impossible to score against, with your best bet being trying to sneak it past them at the near post after a dinking run. Shooting is strangely the “X” button, which is a button I don’t think many other games have used, and it can sometimes feel counter-intuitive to anyone who is used to playing FIFA or PES, with their shoot buttons being located as the left and right face buttons, respectively. Tackling is handled by the “A” and “B” buttons, with the former being a slide tackle and the latter being a quick touch-styled tackle. Players will automatically ride challenges sometimes, which means that a devastating slide tackle doesn’t always have to mean the end of a potential attack. Holding down “Y” will allow your player to run with the ball, as well as performe some sharp, darting runs to evade challenges. Pressing “A” or “B” whilst standing still will allow you to juggle the ball and set up headers or wacky bicycle kicks. As this game was released following the introduction of the back pass rule, goalkeepers can now run with the ball if you pass it back to them. This would often lead to me trying to go on full length runs of the pitch with the keeper in an effort to score a worldie, which would often lead to my keeper getting dispossessed of the ball and the opposition scoring an easy goal. Unlike in modern games of today, you can actually get most of your team sent off without the referee calling an end to the match itself, which leads to the unusual visual of the keeper walking up to the centre circle to kick off with the remaining outfield player. Be careful not to get that player sent off as well, however, as it will break the game, and you’ll be forced to reset. 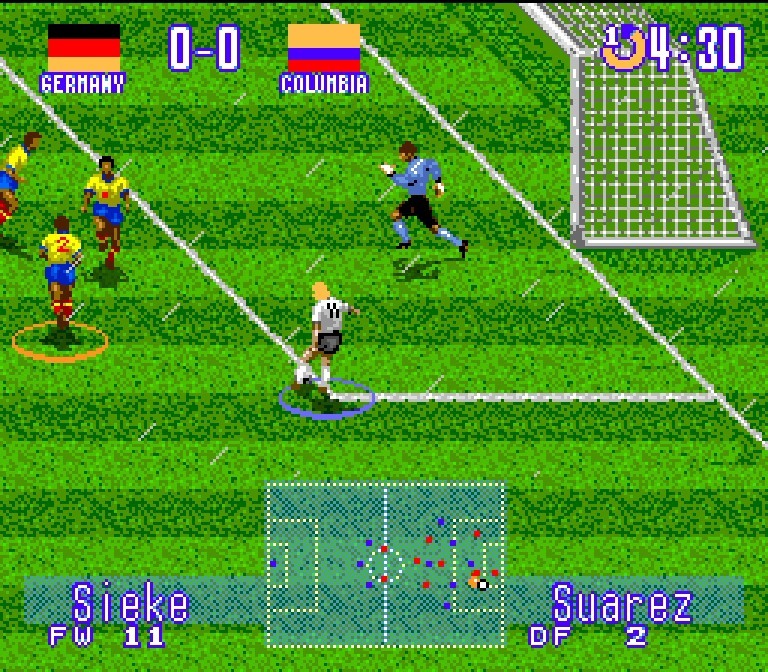 The gameplay of International Superstar Soccer Deluxe isn’t perfect by any means, but when compared to its SNES console rivals, it’s imminently more playable than the likes of FIFA International Soccer, Super Soccer and the awful Champions World Class Soccer. It feels like a genuine attempt to create the feel of an actual football match, which is something you didn’t always get during this period. Along with the standard tournament modes, the game also includes a scenario mode that sees you having to overcome a certain challenge. For instance, one sees a game between Scotland and Russia tied at 0-0, with you having to take control of Scotland and lead them to victory, whilst another sees you as England two goals down against Brazil at home needing to somehow pull yourself into the lead. I do enjoy this mode, and I wish we saw it more in current games today, especially if it was done with classic sides. Overall, I still really enjoyed International Superstar Soccer Deluxe when I went back to it for this feature. It’s playable, it looks great, and most importantly, it’s just fun to play. In my opinion, this is the best football game you can find for the fourth gen consoles, and I strongly recommend you giving it a bash if you’ve never played it before. You’ll be looking at about £15-20 if you want to purchase it online, but I’d say that’s a reasonable price for such a good game. If you’d like a comparison of the game on each console, click the links for the SNES, Mega Drive and PS1 versions of the game.